The U.S. 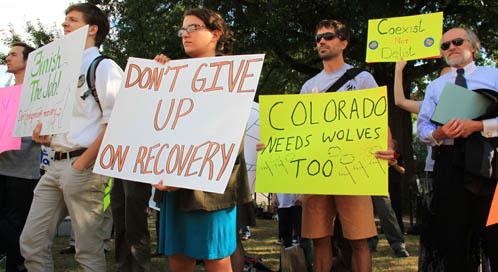 Fish & Wildlife Service held several public hearings across the country on their proposal to strip Endangered Species Act protections from most gray wolves in the U.S. At each one, Defenders was there to rally with wolf supporters, provide information on the proposal and on wolf recovery, and train advocates on how to testify at public hearings. All butterflies look dainty and delicate, but the strikingly beautiful and endangered Karner blue measures only an inch across — about the size of a postage stamp — and lives only about a week.